Another month, another old school death metal band. This time it is the debut full-length of Ohio's Shed the Skin up for dissection. So, which particular old school is up for worship this time one might ask? Actually, it is pretty much all of them. 'Harrowing Faith' combines influences from pretty nearly every viable scene exploring what death metal could become during the early 90's. You have your blastbeats, your mid-tempo and your doomy passages. You have thrashy riffs meeting the more technical Immolation ditto. Breakneck aggression meets Autopsy-styled horror flick hocks and so on. With all those influences 'Harrowing Faith' is bound to be an incoherent mish mash of styles and influences. Truth be told though, this album is surprisingly focused. All the ingredients mix well and this really has potential to become one rancid filthy stew of old rotten death. However, that is not exactly the case. Sure, all songs contains catchy and enjoyable riffs and hooks. The drumming is frantic and has that tiny bit of sloppiness that brings the late 80's to mind. Yet, there is something missing. Despite enjoying virtually every song for the first minute or so I find myself losing focus the longer the songs progress. Despite the riffs, hooks and lines being enjoyable by themselves they just will not come together properly as actual songs. Partly because that extra touch in the structure and writing of the songs that makes death metal songs actual songs instead of just a bunch of stacked riffs is missing. Partly because this really feels like a modern death metal album drawing inspiration from 25 years ago rather than a lost gem from that particular age. The rancid eerie feeling of rotten carcasses that got the youth of the 90's hooked is simply nowhere to be found on this album. 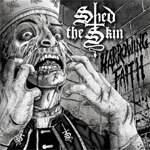 The members of Shed the Skin are all experienced in the game and can add renowned acts such as Incantation, Sinister and Acheron to their collective CV. With that kind of know how I would have expected more than this. 'Harrowing Faith' is not a bad album, but not a good one either. It is simply old school death metal, albeit with a whole bunch of well stitched references, sadly lacking the key finishing touch to become something more than simply old school death metal.